Joe Withnall was born on January 11th 1925 in Burton-on-Trent, and moved with his family to a mining village (Church Gresley) in South Derbyshire where he attended the local village school (York Road School) until he left at 14 years old. At about 15½ years old he volunteered for the Home Guard & was accepted (even though the enlistment age was officially 18). 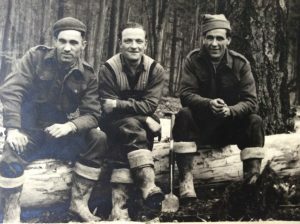 He initially pursued a career in engineering taking an apprenticeship in centre lathes, and since Joe was undertaking valuable war work in the production of munitions, his firm were keen to keep him rather than have him conscripted. However, Joe was keen to go in the army and on February 2nd 1943, aged 18, Joe passed his Army medical and began his training. 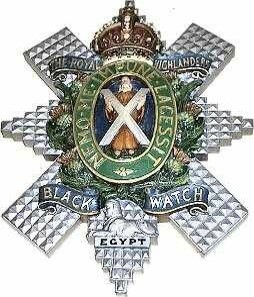 He joined the Black Watch (which needed reinforcements following loss of troops in their conflict in the desert), with six weeks initial training at the depot in Perth followed by a specialised, training course, learning to drive. Specialist training for D-Day then took Joe to South Wales, the Isle of Bute and then Suffolk, with the focus being on preparation for landing and coming ashore ahead of the invasion of France. Joe actually landed in Normandy several days after the rest of his battalion (who landed on D4) on D7. While he had been stationed at the core reception station at Thetford he became ill with tonsillitis and the battalion moved on, so he did not catch up with them until they were in Normandy. He recalls that the crossing was reasonable, and he did not feel much seasickness. On arrival at Normandy, Joe remembers being frightened, and that ‘you took the orders you were given, and did the best you could’. Although he was only a few days behind, by the time he was reunited with his battalion, they had been engaged in the Battle of Rory and a large number of the unit had already been lost, either wounded or killed. Once he caught up with the battalion, he stayed with them until mid-August, after the push for the Falaise Gap. Joe recalls: About a month after the invasion, in July we were holding the line in Normandy when one night, just about dusk, we experienced a terrible bombing from a German aircraft. We wondered why we were singled out and then found out later that just behind us the rubber tanks (which were an exact replica of real tanks) that Winston Churchill had made use of as decoys were parked just behind us and that had been the real target that the German aircraft was after. one occasion was a night attack we were engaged in and fires were burning all around. We soon found out what was happening – the Germans were blowing up all their equipment (like big high range guns and trucks) presumably because they were out of fuel. In the light of the fires, a high ranking German officer walked out, giving himself up for capture to myself and two pals. He was about 6feet 6 inches tall and had all the regalia on, the iron cross & medals and jack boots. We all shouted in German “Hands up!” and he said in perfect English: “Mere boys.” We delivered him up to HQ pretty fast. The most significant incident that the battalion was involved in was reinforcing the Ardennes after the German counter-attack. 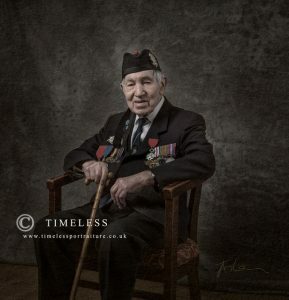 He recalls relieving the 53rd Welsh Division, and seeing many of their men suffering badly from frostbite.On the 23rd March 1945, his battalion (the 51st Highland Division) crossed the Rhine. It was said at the time that we were the first to do so. At the Rhine crossing it was like Blackpool illuminations, only not as friendly. I remember, before we had fired a shot, we were in the landing craft and the Germans had cut the sides of the river bank so that they were absolutely vertical. As the landing craft touched the water it nose-dived and the bow stuck in the mud at the bottom of the Rhine. About 30 men dropped in a heap, with guns, rifles and all equipment piled on top of each other. The landing craft swayed to and fro for what seemed like an eternity and then slowly dropped, the right way up. There again, we were lucky! Soon we were at the other side, landing to the sound of our piper (each company had a piper) playing a Scottish tune, which could have been (I’m not sure) the March of the 42nd Regiment. He recalls that their task was to take a sluice gate that the Germans were strategically opening in order to flood areas that might be used by Allied troops. Fortunately, there were relatively few casualties in this operation, and after that the battalion went on to take a number of smaller strategic points across Germany. After the war ended, a number of units were split up, and Joe ended up with the 1st Battalion Manchester Regiment. They were located on the border of the Russian and the British Zone, and were ordered to patrol the crossing to prevent people entering into the British Zone. He recalls that the British and the Russians did not get on well, and would often switch off the power supply to the other side of the zone. Joe was stationed there until he was demobbed in York in 1947. Joe went back to civilian work in engineering as a machine operator. He moved to Edgeley, Stockport in 1948 (as a result of having met his future wife, Bertha) and transferred to Mirrlees Engineering Company, working there for 31 years, before becoming a company driver until retirement in 1993, at 68 years old.